Throughout the history of football there have players that always wow the crowd. Cristiano Ronaldo is one of them. By the age of 21 he was showcasing his football at Manchester United, but his football continues improving. His technique, speed, strength, agility, dribbling skills and powerful windup and shot have earned him the respect of football fans around the world. The 2008 Ballon d’Or, FIFA World Player of the year and Golden Boot winner improvises plays never seen before. No matter if he is on the left or right flank, his opponent’s say he is impossible to stop. He is lethal in front of goal and can score on a whim with his head, from outside the box, from a set-piece… He is as decisive as they come, and at the age of 24 Ronaldo has won more titles than most and is the vice-captain for Portugal. 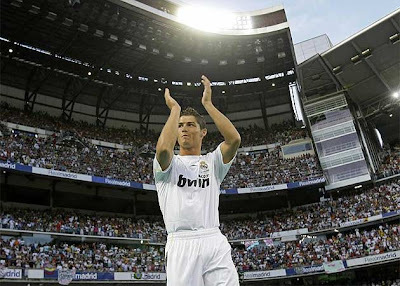 Cristiano Ronaldo was born and raised in working class neighborhood on the Portuguese island of Madeira. Nació y creció en un barrio obrero de la isla portuguesa de Madeira, en el seno de una familia humilde, junto con sus tres hermanos. He officially began playing football in 2003 for Clube Futebol Andorinha de Santo Antonio. By the age of ten, the islands more prominent teams began expressing interest in the phenom. Ronaldo joined Nacional da Ilha da Madeira, where he continued his meteoric rise and one year later was on the move to Lisbon, where he signed for Sporting in 2001. He is still the only player in club history to be promoted by four academy teams until debuting with the first team in one season. Ronaldo scored a brace in his first match against Deportivo Moreirense and went on to win the Superliga that same year as a mainstay One season later he made his European debut in a Champions League qualifier against Inter. The turning point of his career was a brilliant performance during a friendly against Manchester United in 2001. Ferguson later admitted that his players couldn’t stop talking about Ronaldo. Even on the flight back to England, players of the likes of Roy Keane and Van Nistelrooy insisted that the manager sign Cristiano. The official announcement was made one week later after ManU paid £12.24 million for his services; a record transfer fee for an adolescent. Ronaldo proved his quality during his first year in England in the 2004 FA Cup final; he scored the first of his team’s three goals, which eventually gave them the trophy. He became one of the best young players in the world during his second campaign in England and earned FIFPro’s Special Young Player of the Year award. He entered Manchester United history on 29 October 2005 by scoring the team’s 1,000nd goal in the Premier League. 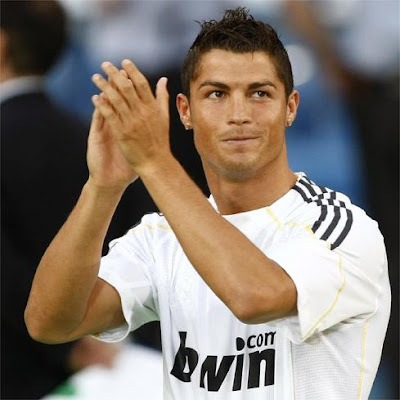 Ronaldo netted 17 strikes the following year, becoming the second top-scorer in the Premiership. He also made the championship’s 2006/07 Team of the Year alongside six other ManU players. Cristiano Ronaldo perfected his quality in the following years and also managed to stand out for his intelligence and great physique. He became the top-scoring right winger in Manchester United’s history in March 2008, breaking legendary George Best’s 32-goal record of the 1967/68 campaign. This was the first of a series of achievements, which also included winning the Community Shield, the Premiership title and the Champions League trophy. On a personal level, he won the Ballon d’Or, the Golden Boot, the FIFA World Player award, the FIFPro award, the UEFA Club Forward of the Year distinction, and became the top-scorer of the Champions League. At just 24, Ronaldo is the second captain on the Portuguese national team behind Nuno Gomes. He made his international debut on 20 August 2003 against Kazakhstan and represented his country in the 2004 Olympic Games of Athens. Scolrai didn’t count on him much at the start of the Euro 2004, despite the insistence of fans and journalists, but he eventually became a prominent player on the team, which lost the final 1-0 against Greece. Ronaldo played at a very high level in the 2006 Germany World Cup, but the team lost against France in the semis and against Germany in the fight for third place. Portugal lost against Germany again in the quarterfinals of the Euro 2008.